A condition where the bones become brittle and become at greater risk of fractures. Fractures potentially causing life threatening problems. Hip fractures can be one of the most life threatening, with approximately 20 – 25% who suffer hip fractures die within the year! Can you do something about Osteoporosis? Eat a good diet in calcium, Vitamin D and protein. Healthy body weight, if you are too thin and a BMI under 19 and at a higher risk of Osteoporosis. Medication might be needed if you have osteoporosis, get tested. One of the main things is to MOVE MORE, inactivity results in increased loss of bone mass. 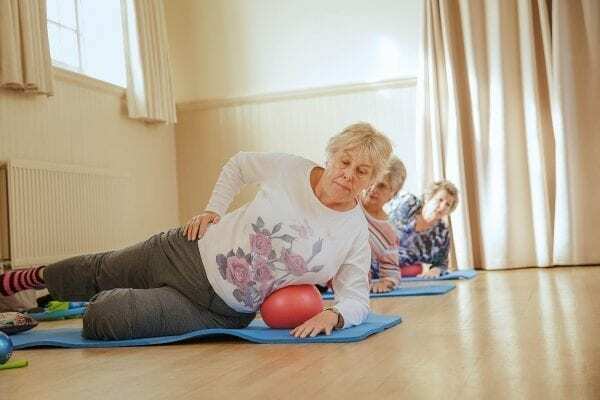 Pilates as we know is great for strengthening muscles, improving balance two of the main things we need to focus on to help with strengthening and maintaining our bones. There are various ways to do Pilates either on equipment or the mat! There are various matwork exercises that involve a lot of forward flexion, lifting the head and rolling, these are not good for for the spine as they can cause spinal fractures. This doesn’t mean that you shouldn’t do Pilates as most exercises can be modified, so that you get the benefits still but are safe! A good Pilates teacher who specialises in Osteoporosis will have no problem in you joining a class. If you have Osteoporosis then Pilates main benefits for you are muscle strengthening and balance. There are also some great exercises on the side and front which are great for protecting the spine. PreviousPrevious post:Learn how to do Pilates at home.NextNext post:How does the clocks changing affect our exercise?